All parents are invited to Back to School Night on September 12. Parents -- You should be receiving a yellow postcard in the mail from EDHS. Please keep an eye out for it. 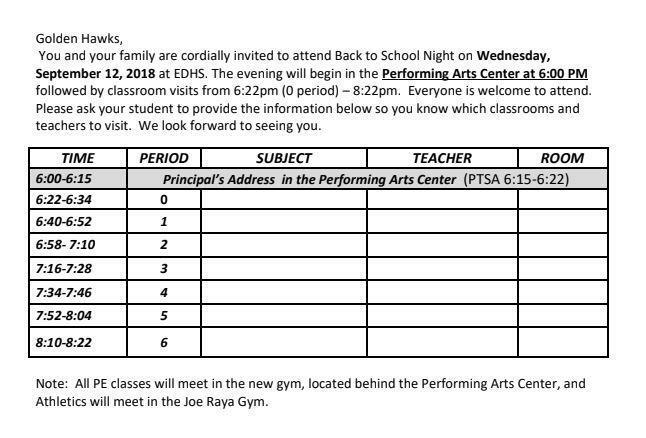 It has all the info you need for Back To School Night. This important event will be held one time this year -- on September 12, 2018. The evening starts at 6pm in the Performing Arts Center. You will have 12 minutes to hear a little about each class your student is enrolled in. 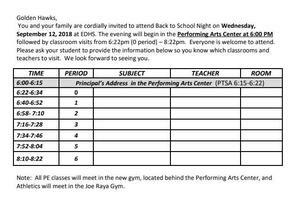 Please ask your child to fill out the card with their schedule and bring it that night. We will have maps on hand a lots of student helpers to guide you around the campus. Click the attachment for a copy of our school map.